Apparently Bottlenose Dolphins use specific “whistles” to speak, greet or acknowledge other individual or groups of Dolphins. How cool is that? We knew they were clever, yet it never occurred to me specific and uniquely individual names were part of the equation. Dr. Tess Gridley of the University of Pretoria and Namibian Dolphin Project and Sea Search listened to hours of hydrophone recordings (underwater microphone) – dolphins used “signature whistles” when approaching or calling for each other. At first glance not a particularly earth shaking ponder. That said, and with polite hope you allow conventional perspectives to wander ever so slightly – who’s to say mankind takes home all the evolutionary blue ribbons. 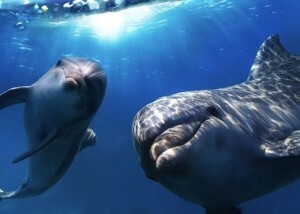 For all we know, Dolphins shake their heads while snickering “you poor misguided fools”. Would it be preposterous to consider extraordinary evolution amongst species other than ourselves?